Disponible toutes l’année en magasin. "Un polo jersey en Merino juste incroyable, tous les avantages du merino dans un beau produit." Dedication, preservation of traditional craftsmanship, focus on technological innovation and attention to environmental protection: these are the values that underpin the entrepreneurial spirit that has driven REDA 1865 for four generations, the same ones on which the philosophy of the Reda Rewoolution sportswear line is based. To Reda, environmental protection is a project in continual evolution. In fact, Reda Rewoolution products are made by the only wool mill in the world that holds the EMAS environmental certification. The entire production process moves along a closely controlled chain, guided by the principle of sustainability which, thanks to an eco-management system, not only respects the environment, but also, first and foremost, applies a constant and continuous quality control aimed at reducing environmental impact to a minimum. 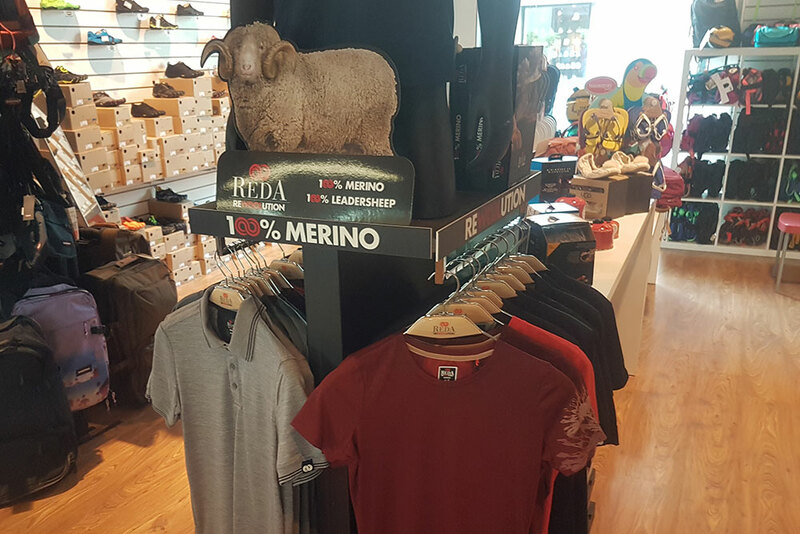 Reda selects Merino wool from sheep ranches it owns in New Zealand: traceability is guaranteed from the very start. Reda Rewoolution follows the progress of its wool from shearing on, managing the processes during every stage. Thanks to the voluntary certification of textile traceability, it is possible to be completely certain of the origin of the clothes one wears. The process begins in New Zealand, home of the world’s finest sheep, whose wool is certified by Zque, the first step in a high quality production process that all takes place at Reda’s facilities in Biella. Total transparency becomes the byword of a 360° experience, entirely Made in Italy. Outdoor: with our eyes on the mountains, the ideal setting for numerous sports and activities, regardless of the weather or the season, we present the Outdoor line, characterized by articles of the second and third layer, featuring attractive lines and superior technical solutions. A range of colours is in line with the latest trends in the sector, unique, high-performance textiles, up to the minute graphics and an abundance of technical details: these are the plusses of the articles we offer. Inspired Active: Innovative technology and top of the line natural materials are blended in this line, designed for to the most intense, high-impact sports. The items are mostly made of REDA ACTIVE SINGLE JERSEY, combined with a next-generation material, REDA ACTIVE MESH, in 100% VW, whose special ‘webbed’ structure permits elevated breathability and heat regulation, much used in Body Mapping. To complete the range, some second layer articles made of REDA ACTIVE PUNTO ROMA: a new way of seeing active sports without giving up the uniqueness of Made in Italy textiles. Sport&Fun: The articles in this line are made of REDA ACTIVE JERSEY, PUNTO ROMA and POLAR FLEECE, and are characterized by a linear design Heat regulation, fast drying and light weight make these articles “must-haves” for sports, travel and every leisure time activity. Next to skin: The line consists of articles made entirely of REDA ACTIVE JERSEY and PUNTO ROMA, characterized by soft, lightweight textiles that provide elevated thermal protection. Ergonomic designs based on Body Mapping guarantee optimal comfort in contact with the skin. Heat regulation, fast drying and light weight make these items indispensable for taking on any sports challenge, facilitating optimal performance regardless of the temperature outdoors.